Head over to North Park for the best sledding in Brunswick! 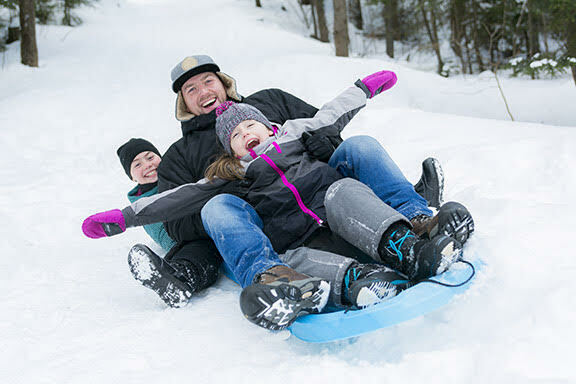 One of the top ways to enjoy the outdoors throughout the snowy Brunswick-area winter is to go sledding! The kids love it, and let’s face it, it’s great exercise for everyone. Looking to plan some nearby fun for the family? Or just hit with a major snowstorm that closed the schools? Check out Brunswick’s North Park Sledding Hill at 3595 Grafton Road. North Park is Brunswick’s largest community park. The main entrance and parking are accessed off Grafton Road. In the late 1970s, plans for the park’s initial 42.5 acres were to include baseball and soccer fields with a recreational focus. From a lack of funds to develop the site, the natural features were recognized for their great potential and the focus switched to a “passive” park. In the mid-1980s, fifteen acres were added to the park with a donation from the State of Ohio. Since then, approximately seven acres of forest have been added because of negotiations with developers of the Woodlands subdivision and North Park Estates. Local Brunswick residents all agree that North Park is the perfect place to go sledding this winter. It’s conveniently located and guaranteed to please everyone in the family! • No clothing with drawstrings or scarves, which can get wrapped around the neck. • According to medical experts, most sledding injuries occur when there is no adult supervision. • Sled sitting up and facing forward — never headfirst, facing backward or standing. • Go down the hill one person at a time to avoid collisions. • Never ride a sled pulled by a moving vehicle. Click here to read the December edition of the Brunswick Real Estate News! November is a busy month for families, and here in Brunswick it's also a busy time for home buyers. 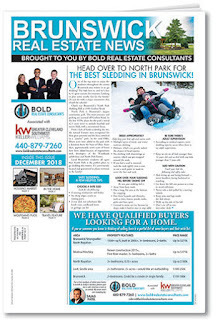 As a Brunswick and Greater Cleveland are resident, you'll want to check out our cover story about the greatest winter activity of all time...SLEDDING!. We also encourage you to read our article on stabilizing home prices here in Brunswick. This month, you'll also find some fun, family-friendly events happening around town, a Q&A with Sajag about estimating the value of your home, a spotlight on high-tech home appliances, and more. Our November recipe is from Wolfgang Puck's kitchen - Crispy Potato Galettes - and as always, our featured properties on page 12. We hope you enjoy reading this edition of the Brunswick Real Estate News as much as we've enjoyed creating it! 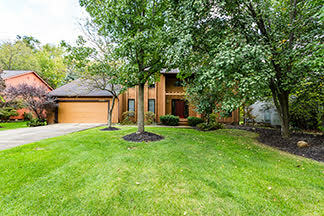 Welcome to 36293 Derby Downs Drive. Step into the beautiful entryway that has vaulted ceilings and a gorgeous chandelier. Follow along into the vast living room with full-length windows. Cross into the dining room that features another stunning chandelier. Visit the eat-in kitchen, that has shining marble countertops, oak cabinetry, an island, and the appliances that stay with the home. 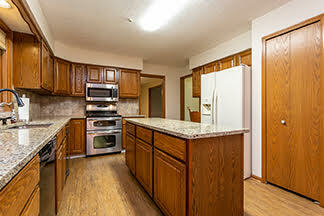 The kitchen also has sliding glass doors that open onto the deck. 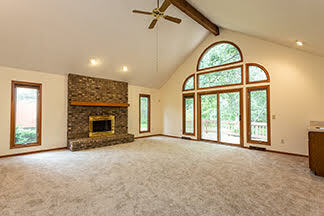 Make your way into the family room, with a gas fireplace, vaulted ceilings, built-in wet bar, and sliding doors that open onto the deck. The first floor also contains a laundry room, an office, and half bath. 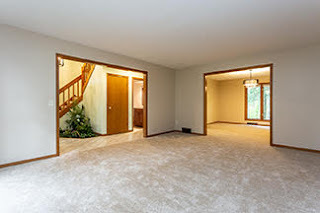 Make your way upstairs to the large master bedroom with a connected sitting room, and a customized master bath. 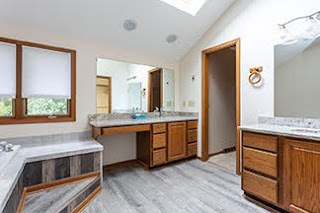 The master bath contains his and hers vanities, a giant jacuzzi tub, and a large shower. 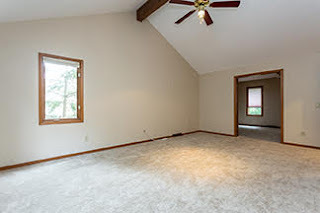 This floor also has 2 large guest rooms and a full bath. Unfinished basement great for storage. 2 car attached garage. 1-year home warranty included for peace of mind.